Note: You can use CTRL+F to find a specific aged-based, topic-based, level-based game, etc. 1. From the target vocabulary choose three simple cards. 2. Place them face-up forming a line. 3. Elicit and practice with the Ss each one as you turn them face-down. 4. Now make a brief shuffle. 5. Ask Ss "What's this?" while you point a card. 6. The first S to respond gets to keep the card. 7. Continue to do so with the two cards remaining. 9. At the end have Ss count their cards up. The one with the most cards is the winner. Variations: For Young Learners you want to shuffle only one card per "round"
targ For Adults you can use more than three cards at the same time. 1. Line up 8 face-up cards from the target vocabulary. 2. Review, elicit and practice them with the Ss. 3. Have the Ss call all the cards. 4. Now face down the first card and have the Ss call again all the cards but trying to remember what the face-down card is. 5. Continue to do so with all the eight cards so that at the end all of them are face-down. 6. Have the Ss call all the face-down cards. Variations: To make it funnier, once the Ss are able to recall all the cards, have them do one round but starting from the last card! (counterw se). Again, the younger your Ss are, the less cards you should use, and vice versa. It can be exhasting for your students to memorize all the words, so I suggest that you do ONLY one round, but include those cards that are "hard-to-remember" for Ss. 1. 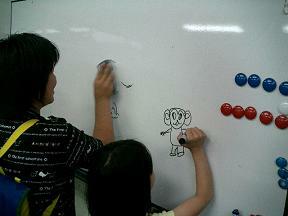 Divide the board into to halves and in each one draw a big frame. 2. Have two Ss go to the board. 3. Pic a word from the target vocabulary. 4. When you call the word out, the Ss must quickly draw it into their frames. 5. The S who first and more neatly to finish drawing earns a point either for him/her or for his/her team. 1. Students might be in teams. 2. The teacher calls out either "Bring me a ruler." or "A ruler, please." 3. The first student / team to bring it to the teacher earns a point. Variations: You can use either flash/picture cards or Realia (Real objects). You can have the Ss work alone or divided into teams for the large classes. 1. 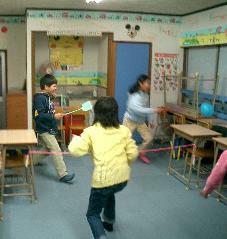 Set a "Badminton" court in the classrom with two chairs and the skip rope. 2. Divide the class into 2 or more teams depending on the number of Ss. 3. Inflate a balloon to a medium size (the younger kids, the bigger the balloon must be). 4. Give each player a "raquet" (flyswatter). 5. The rules are: to hit the balloon so that it does not touch the floor. Otherwise, the team who drops it must call a vocabulary card by the other team chosen. Variations: Have the Ss make more complex structures such as: "S/he is dancing", "I want to be a..." or "She's from..." etc. Materials: A large piece of Tag board & one permanent Black magic marker. 1. Cut the tag board into 1" by 2" pieces. 2. On each Piece print 2 letters, make the pieces look like dominos, but with letters. 3. Use all upper case, or lower case. 4. If the children are ready for a challenge use both upper and lower. 5. Play as you would with regular dominos!!! 6. You can also make these using shapes, colors, animals, etc. 1. Show the Toy money to the Ss and elicit "What'S this?, How much is this?" This is the best way to call their attention. They will be excited and interested in what's coming next. 2. Place one buck per denomination ("amount") on the table: for example, if you have $20's, $10's, $5's and $1's you should have each one of these on the table so that the Ss can see them (refer to the picture). 3. Have the Ss choose a Topic (Fruits, Animals, Veggies, School Objects, Places, etc etc) NOTE: Review if necessary. 4. Tell the Ss that you will secretly choose one item and then give them 4 hints so that they guess it. 5. The rules are: If somebody guesses the Item when you give the first hint, that S gets to keep $20 USD (or whatever denomintaion you are using). If somebody guesses on the second hint it gets to keep $10 USD. On the third hint $5 USD and $1USD for the fourth (and last) hint. You will see the Ss doing their best to try to guess!! NOTE: They should not raise their hands to answer but call the item out (or yell). 6. If two Ss answer correctly at the same time just split the amount, and so on. Variations: You can spice this up by asking the Ss pay you $1 USD (TOY MONEY OF COURSE!) if they do not even try to guess or talk. This willencourage EVERYONE to talk! ENJOY.